Bariloche Lake District: tourist-oriented maps and info about tours, treks, points of interest and activities in Patagonia Central Andes’ Nahuel Huapi and Lanin National Parks. (Bariloche – San Martin de los Andes – Bariloche) . This is one of the most popular Lake District excursions. As the name suggests it takes you through post-glacial valleys dotted with crystal clear lakes, waterfalls, rivers and hills covered by forests. Let me make it clear from the beginning - the Andes chain is not much visible along the trail (If that is what you want then you may have to take Altas Andes excursion from Mendoza). It starts from Bariloche taking the road 237 north along the lake Nahuel Huapi to Villa la Angostura. From there it follows the Seven Lakes Trail by a gravel road offering views on lakes Correntoso, Espejo, Falkner, Hermoso, Villarino, Machonico – all of glacial origin some ten thousand years ago. The gravel road changes back to the paved one when crossing from the Nahuel Huapi National Park to the Lanin National Park. Finally it arrives to San Martin de los Andes, a small but picturesque city on the shore of Lago Lacar. From here the trail goes back to Bariloche but this time mostly outside of the national parks along the road 63 crossing famous Patagonian steppes. These vast territories are shaped by strong winds and lack of precipitations (only 600 to 1000 mm per year). The yellow and ocher colors with little green are largely dominating the landscape for as far as you can see. Enchanted Valley - Rio Limay. The last stop on the way back to Bariloche is at “Amphitheatre” – an amazing landscape shaped by glaciers with a final “touch” by the Limay River: turquoise waters and lush vegetations in the middle of the steppe burnt by the sun to yellow-brownish colors. This circuit covers quite similar area as the Seven Lakes one although in an opposite direction. Starting from Bariloche along the Nahuel Huapi Lake and then Limay River it takes you to Anfiteatro, then to the Confluencia along the Enchanted Valley. 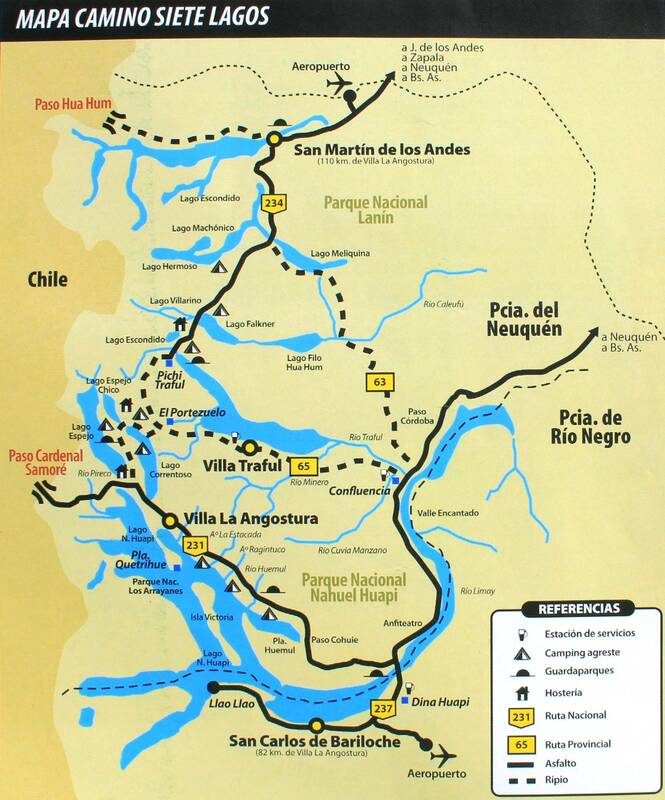 Here the circuit diverges - instead of heading to San Martin de los Andes it takes you along the Traful River to the Traful Lake. From that moment you abandon asphalt and continue on a gravel road rewarding you with a spectacular Punto Panoramico – a scenic viewing point on top of the 70m (230 ft) cliff overlooking the deep blue waters of the Lago Traful. You will stop at Villa Traful – a small city where you can refresh and have lunch. Then the circuit joins the Seven Lakes trail on the way back to Bariloche via Villa La Angostura. Touristic section of the Isla Victoria on the Nahuel Huapi Lake next to Bariloche. Victoria Island is a 20km (12.5 miles) long stretch of land in the center of the Lago Nahuel Huapi. The access to the island is provided by boats from the Pañuelo Port in the Llao-llao peninsula to the landing point in Puerto Anchorena on the island. Usually it is part of the full-day trip covering also Arrayanes Forest on the Quetrihué Peninsula. The island underwent dramatic changes in early 20th century when a businessman from Buenos Aires - Aaron Anchorena – came here as a tourist. He decided to establish on the island an “estancia” (farm) with gardens, paths for pedestrians and horses. Following the plans he converted the island into huge nursery for many exotic trees. 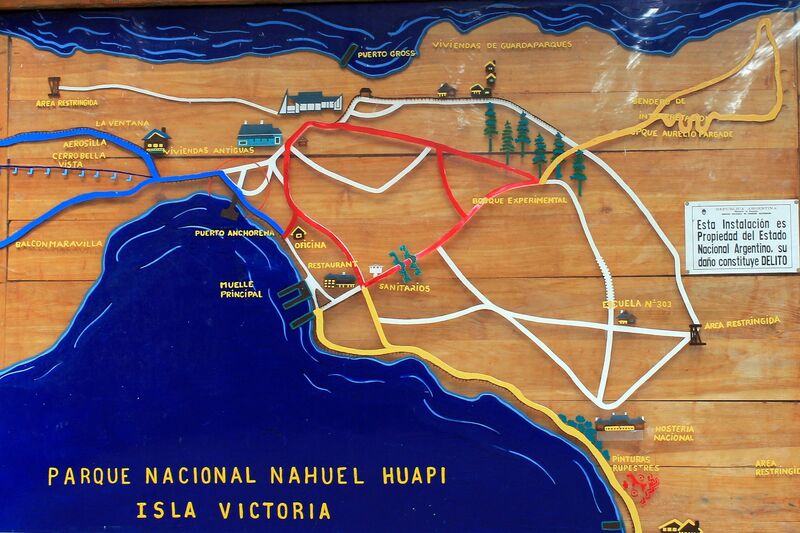 The creation of the Nahuel Huapi National Park in 1937 changed these plans from business oriented to nature conservation ones. Due to its unique flora and fauna the northern part of the island was declared a strict reserve not accessible to the public. Mount Otto is the closest “lonely hill” next to San Carlos de Bariloche. It is popular between tourists for its revolving coffee room ( Confiteria Giratoria) from where sipping the cup of “café con leche” you can see changing vistas on Andes and Bariloche Lake District. The one full cycle takes about 30 minutes. Views are magnificent, but as the Mount Otto with its 1405m (4610ft) is higher than the Cerro Campanario and situated further from lakes, a very good weather is the “must” for far reaching visibility allowing you to fully enjoy the “fiesta”. Surprisingly, below the cafeteria level you will find an Art Gallery with exhibition of replicas of greatest Italian Masters (El David, La Piedad and El Moises produced by the Florencia Pietro Bazzanti Gallery).. Although you can get to the top by either hiking or climbing the narrow gravel road by car, the best way to get to the top is to take a cable car. Gondolas for 4 people make it to the top in about 12 minutes. The name of the hill commemorates an early promoter of mountain climbing and skiing in this part of Argentina – Otto Meiling. The name “Cathedral Hill” was given to this mountain due to the characteristic shapes of its peaks resembling cathedral’s towers. 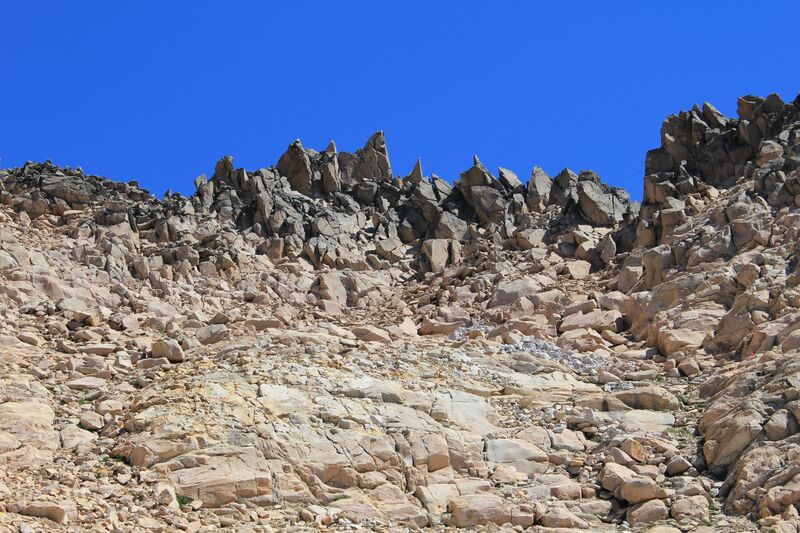 Actually these intriguing peaks of Cathedral Hill are the first to be seen on the way from the airport – a sort of the welcoming symbol of Bariloche for tourists. Reaching 2388 m (7835ft) Cathedral Hill it is one of the most popular ski centers in South America. It takes three long sections of chair-lift and about 45 minutes to reach the highest part of the mountain. During summer time it is quite educational trip because on the way up you will cross few climatic zones with different type of vegetation.